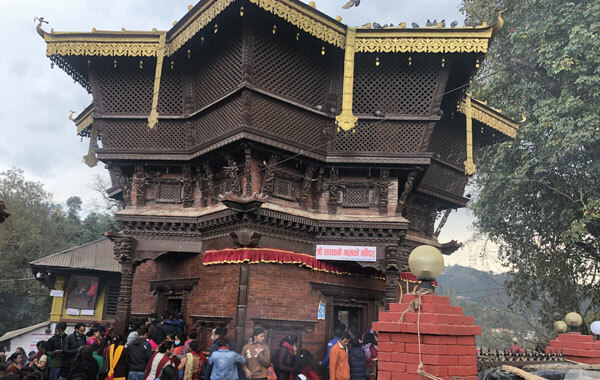 Sali Nadi temple tour, Sankhu is the ancient Newari town located in the north-east corner of Kathmandu Valley it is about 17 km from tourist hub Thamel, Kathmandu. It is 1-hour drive by car from Tourist hub of Thamel. Sankhu is also known as Shankharapur for its famous ancient Sankha-shaped town structure. Where the Month of Magh in the Nepalese calendar, Sali Nadi is like an attractive place for Hindu devotees. As Hindus in Nepal worship goddess Swasthani and read the story about her, many Hindu devotees take fasting for a month and worship the Swasthani goddess. Sankhu is also famous for Sali Nadi Mela. It is a small town, from where you can start hiking to Nagarkot viewpoint every time. The festival begins every year on the first full-moon day of Poush (January), the ninth month of the Nepalese calendar in sali Nadi temple. In other places in Nepal during the Poush month, Goddess Shree Swasthani is worshipped every day, and read the story of goddess Swasthani and Lord Shiva. it is also known as Swasthani Puja in Nepal. The devotees fast for a month eating only one time a day, taking always the holy bath in the morning, and wearing the nicely daily washed pure clothes. All of the hand and feet’s nail should be nicely trimmed while going through the Swasthani Book. Especially millions of Nepalese Hindus women practice this one month as long fasting to their husband’s prosperous life and the unmarried women do the fasting for to get an ideal husband in future. During the month of Magh, many devotees go Sankhu, Salinadi for ritual holly bath in Salinadi River. It is also believed that having a ritual bath in Salinadi River, may remove all the sins and bad activities. Well Sankhu, salinadi is Newar community. Different Newar community’s people celebrate various cultural festivals in Sankhu, salinadi. Throughout the trips, you can also well-know about Newar community and its festivals around the base of sankhu areas. For more, Sankhu, salinadi is the hiking route to Nagarkot viewpoint. It is a 3-4 hours trek from sankhu areas. Throughout the way towards Nagarkot can find great scenic beauties with fresh evergreen green natural surroundings. While coming to the Nagarkot base point, you can warmly overview the major hilling mountains which easily capture the eyes and feelings. Furthermore, the great attractive views of sunrise and sun seat from Nagarkot. For more information about trips to various religious places of Nepal, you can kindly drop your information to grab the two days trekking opportunity. Sankhu, Salinadi Temple is a religious place where you can create a good memory on holiday. Similarly, we Boundless adventure carry out the different religious tour and trekking all around Nepal. We do provide you well-experiences trekking guide, itinerary, and permits with reasonable cost and price.